Like the name dot snails already states, those tiny snails are the smallest native snails. Their shell only grows to a millimetre size, even though it never stops growing. Dot snails are distributed worldwide. The snails live under the layer of dead leaves in forests and they feed on decaying plant matter. The dot snail family gave its name to the superfamily it belongs to, together with the disc snails (Patulidae) and several families of overseas snails. 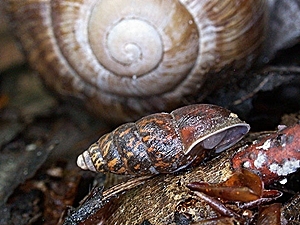 snail (Ena montana), from Switzerland. Pictures: © Stefan Haller, (schneckenfoto.ch). The Ena montana, compared to a Roman snail. Description: The dot snail has a tiny, almost flat shell. Its colour is a horn-like brown and its silkily shining surface is striped narrowly and regularly. The aperture is rounded and its rim is neither folded back, nor does it display an apertural lip. The shell navel (umbilicus) of a dot snail is quite wide, about a quarter of the shell width. Dimensions: 0.6 - 0.8 mm; B: 1.1 - 1.6 mm; U: 3 - 3½. (Abbreviations). 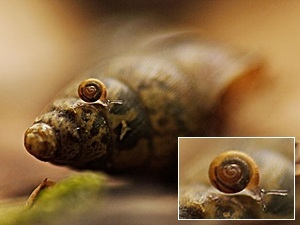 With its size of maximally 1.6 mm, the dot snail is the smallest native snail. Habitat and Distribution: Mostly, dot snails live in the leaf litter of forests, especially they are characteristic for beech deciduous forests on acidic ground, but dot snails are more frequent on calciferous ground. Sometimes dot snails can also be found in open places. The species is well adapted to humid habitats, as well as to dry and sunny ones, but dot snails are rare in places strongly influenced by man. In Portugal, dot snails not only live und leaves and bark, in the moss and between bark lichens, but also on old walls. Dot snails are distributed in Europe, as well as in West and North Asia. In Switzerland they live in altitudes of up to 2500 m MSL, in Bulgaria until 1500 m MSL. Like all terrestrial pulmonate snails, dot snails are hermaphrodites, but they can also reproduce by auto-fertilisation. They can reach an age of 200 days. Francisco Welter-Schultes: Punctum pygmaeum species homepage.